Hannah works for a company called Outdoorsy, that is basically airbnb for camper vans. We ended up having them bring their amazing van for the first session and it was such a big hit that they brought another one for the second (since their van was currently being rented!). We had so much fun incorporating their van in the photos, something Callen and I would absolutely do with a real session in Yosemite. We loved getting to show the attendees this side of our photography business, even though most people think of weddings first, because adventure sessions are some of our favorite gigs to shoot! It was so much fun watching our attendees form their own bonds with these two. Hannah and Jason were literally perfect for this job and had a blast modeling for what was essentially 4 engagement sessions in one week! 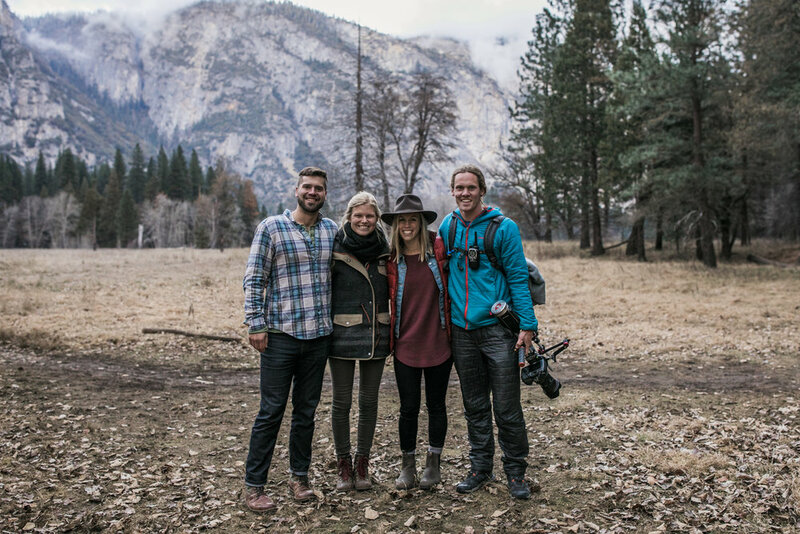 We are so beyond thankful for them making it out to Yosemite twice to do this, and for their incredible attitudes through cold weather and 40+ cameras in front of them in just a few short days. Also, they are actually engaged (Jason actually proposed in Yosemite last year! ), so even though this was technically a “styled shoot” it was 100% real, and now they have a huge variety of engagement photos in two of their favorite places.